With the G5000 integrated flight deck upgrade for the Citation Excel and XLS, you’ll receive the latest in satellite-based navigation capabilities, digital flight management tools, current and future NextGen operational support as well as graphical display technologies for enhanced situational awareness. Better still, this upgrade typically replaces enough outdated wiring and hardware in your airframe to provide a weight savings of approximately 200 pounds or more — giving you the option to carry an additional passenger (or more luggage, golf clubs, cargo, etc.) with the same fuel load. 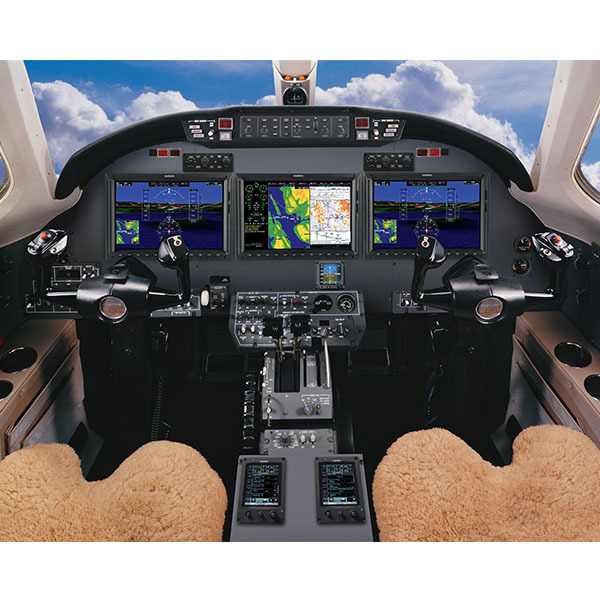 This Citation Excel/XLS glass flight deck upgrade features 3 high-resolution, 14-inch flight displays — a multifunction display (MFD) in the center of the panel flanked by dual primary flight displays (PFDs) at the pilot and copilot positions. In addition, 2 easily accessible touchscreen display/controllers serve as the primary crew interface for the system. For added flexibility and redundancy, the wide landscape-format flight displays can all function in multipane mode, allowing multiple pages to be viewed side-by-side on the same screen. With this capability, pilots can simultaneously view maps, charts, checklists, TAWS, TCAS, flight plans, weather and more — without cluttering or compromising the clean visual layout. 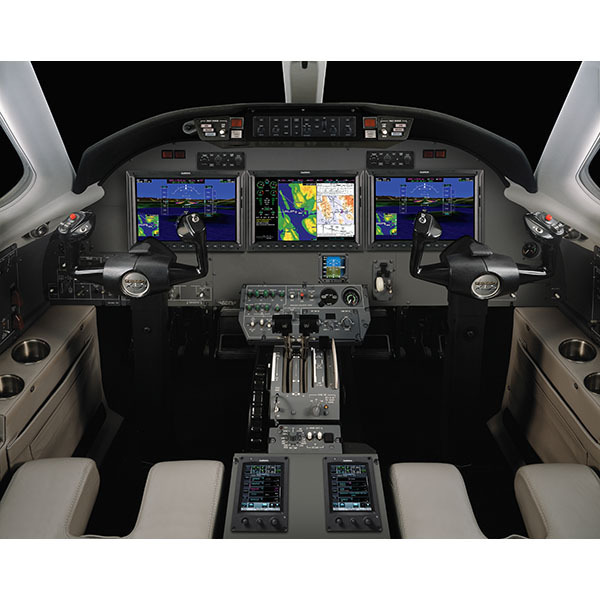 The G5000 integrated flight deck for the Citation Excel and Citation XLS also includes a fully digital, dual-channel, fail-passive automatic flight control system (AFCS). Providing optimized performance throughout your aircraft’s flight envelope, the G5000 system supports a wide range of capabilities that include coupled LPV approaches, vertical navigation, flight level change (FLC) and other sophisticated flight monitoring and performance features. For added situational awareness, optional Garmin SVT™ Synthetic Vision Technology is also available in your G5000 upgrade package. Using sophisticated graphics modeling, this technology creates a 3-D “virtual reality” landscape on the flight display — showing terrain, obstacles, traffic and runway environments in graphical perspective. So, pilots can easily visualize the flight cues they would be seeing through the windshield on a clear day — even when flying at night or in IMC. SVT works seamlessly to alert pilots of potential ground hazards by displaying terrain and obstacles that might pose a threat along with appropriate TAWS alert coloring and voice alerts. In addition to standard TAWS-A terrain alerting, your new Citation Excel or XLS flight deck comes with integrated terrain, obstacles and navigation databases to provide a comprehensive moving-map navigation display. Along with this, georeferenced FliteCharts® and SafeTaxi® diagrams come preloaded on the system. Or, optionally, ChartView is available for those who prefer georeferenced Jeppesen® charts. Designed to be highly configurable and customizable, your G5000 flight deck package can be upgraded with a wide array of options, including the following: Advanced weather radar capabilities such as turbulence detection, ground clutter suppression and windshear alerting; TCAS II systems with ADS-B “In” capabilities for comprehensive active traffic monitoring and future NextGen applications; support for CPDLC, including the FAA’s Data Comm and Eurocontrol’s Link 2000+ programs; SurfaceWatch for enhanced situational awareness while on the ground or approaching the runway environment; Connext global datalink services for voice calling, email, text messaging and worldwide weather coverage; Connext cockpit wireless connectivity to keep all your weather, traffic and more in sync between your avionics and personal electronic devices running select applications; SiriusXM™ satellite weather and audio entertainment links plus much more. And to top it all off, you’ll be flying this new integrated flight deck with the confidence and peace of mind provided by a 3-year warranty and backed by our No. 1-ranked product support team. 1Garmin reserves the right to rescind or change this offer. This offer is only available through participating Garmin Authorized Dealers and may not be combined with any other offer directly from Garmin. Jeppesen® is a registered trademark of Jeppesen Sanderson, Inc. its subsidiaries or affiliated companies. Sirius, XM and all related marks and logos are trademarks of Sirius XM Radio Inc.